I thought I would just spend a moment telling you about why it is now time for things to be shown and said about what is going on in the world today, because the more you look at the things going on the world today the more things become very apparent that something, is very wrong. Let me ask a simple question for this blog. The world can create enough food to feed itself and probably another planet as well. We see people starving all over the world because of lack of buying power. I don't ask this because I haven't figured it out yet, I ask this because I am wondering if YOU have figured it out yet.... WHY is this happening in a world full of food??? Quite simple put, the money system is the worlds biggest religion and it's all based and created from debt. The belief in value is like a virus for the mind. For the worlds people to have access to their own food, the religious belief in money systems will have to come to be seen as the system preventing people to be free with access to food. Money is seen by many as the system "that makes the world go round" but in reality it's the very system that almost makes it possible for the world to stop going round. Money is a tool that can be used in a way that makes "some sort of sense". But when you remove all the jargon and "bs" it remains a system of control. A system to control and enslave the worlds people. I speak to many people over the years and it is interesting and a little worrying how many used to not even know how money was created (note used to) it is also interesting to see people trying to battle with the understanding that the people who have the ability to print and digitally create all this imaginary valueless money don't actually need "to use" this money. They don't "use the money supply they created". They OWN the money supply they created. And it's all based on fictional debt. To free your mind from the control of fictional-value money systems you need to bust the fictions controlling your mind. 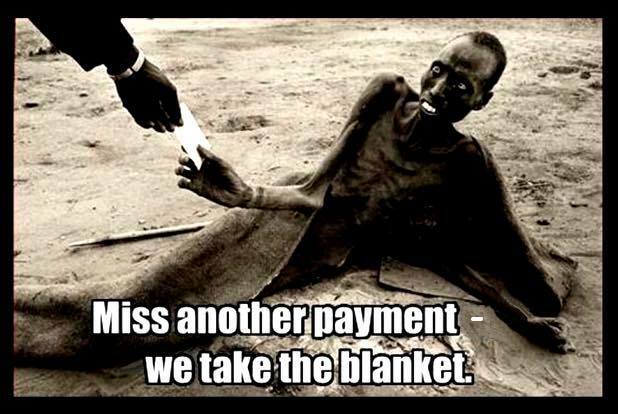 People starving on this planet like this, is nothing more than a reflection of our own ignorance.